Tiger Bill Reviews New Frontier for Drumset by Marko Djordjevic from Alfred Publshing. This book was designed to help you expand your creativity. If you feel you are in a rut and want to be able to expand your creative options when playing the drumset, this book will be a value practice tool. It basically covers the rhythmic subdivisions of two through sixteen, divided into eight chapters. 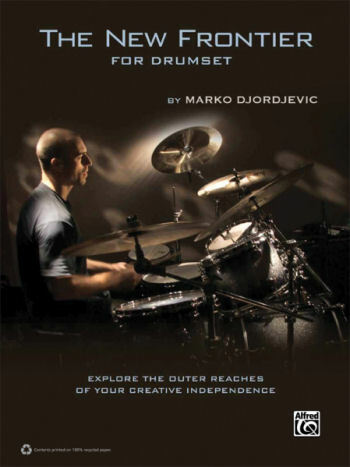 Author Marko's New Frontier Method consists of applying the following seven steps to each of the chapters, as follows: The first three steps apply the bass drum, snare drum, and hi-hat to the rhythmic patterns in various combinations and the second three steps repeat the first three steps, but moving the hand strokes around the drumset. The final step has you combining all of the previous steps. When you finish applying each of the seven steps explained above to each of the rhythmic patterns in this book, you will have each subdivision entered into your muscle memory. This will give you the ability to play endless variations of each pattern at will. Dedicated study and practice of these exercises will provide any drummer with an added vocabulary that can be applied to any style of music and any type of drumming, whether it be solo work, fills, or grooves. Recommended. And, at a retail price of $12.99 it certainly won't break the bank.